Brown eyes are super hot which are perhaps the simplest to make stand out. Moreover, popping your brown eyes takes no time and is super easy to do as it requires very few easily available products. Having brown eyes to make up opens the door for a multiple gorgeous looks. There are numerous ways that can make your brown eyes pop. 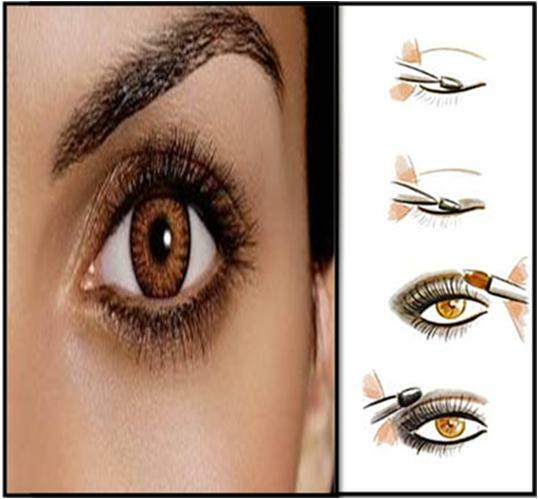 The only thing you have to do is, apply right makeup product, keeping the shape of your brown eyes in mind. Additionally, make sure not to compromise on the quality of the products that you use as fake and unsatisfactory products can ruin your overall effort. First of all wash your faace with affine quality face wash and wipe it dry with a tissue paper or soft towel. Arrange the required makeup products right in front of your dressing table and sit in front of the mirror. Now, pick an eye brush, dip it in a primer and apply it all over your eyelid. Now, top the eye primer with a smokey grey shadow. Use a shadow applicator or shadow brush for this purpose. You can mix light grey and black eyeshades to get a perfect smokey grey eye shadow. Select a shimmery black shadow and apply it to the crease line of your eyes. Blend it with the previously applied eye shadows. Note: If your do not have a shimmery black eye shadow, then you can just mix a general black shadow and light shimmery shadow to get the desired eye shade. Top the shimmery black eye shadow with a thin coat of a silver shadow and blend them to get a nice smokey look. Now, blend out the applied black and silver eye shadows with a beige color. Pick a soft face sponge and wipe the particles of eye shades right below your lower eyelids. Now, apply some concealer to cover the dark circles below your eyes. It is the time to apply some eye liner. Grab a liquid eye liner or a pencil eye liner and gently apply it your upper eyelid, bringing it out into a wing shape. The application of eyeliner is easy as you just have to stretch the outer corner of your eye with your index finger and start the line right in the middle of your lash line. Bring it into the wing and then go back in order to make the inner corner line of eye. Smudge the same eyeliner into your bottom lash line (waterline). Curl your upper eye lashes with a curler. Now, apply few coats of good quality mascara to both upper and lower eye lashes. Note: If you have thin eyelashes, then you can use fake eyelashes, which are easily available in the market and super simple to apply. You can also make brown eyes pop with Green Eyeshadow. 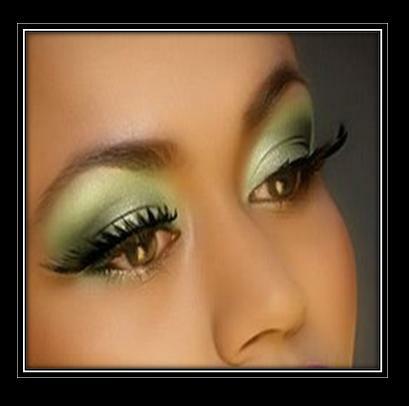 Unknown to many of you, green eyeshades make a more natural and innocent combination with brown eyes. This is best for evening parties and especially with light colored clothes. Give an amazing finishing touch to your beautiful brown eyes by wearing Gold Eye Shadow as it provides an elegance and seductiveness to your eyes. You can wear this eye makeup in day as well as night event. Besides, this is equally good for dark as well as light skin tones. You can draw all the attention to your gorgeous brown eyes with an Arabic Smokey Eye Makeup. This eye makeup requires very simple products and takes no time in application. Make sure to apply light makeup over other parts of face while wearing smokey eyes makeup, as it will enhance your eyes more!